THE CANAL DITCH. 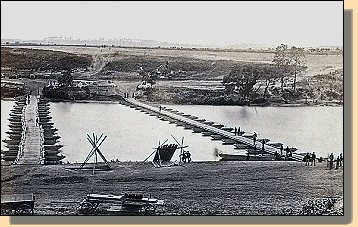 During the Fredericksburg battle, the Union troops became bottlenecked crossing the three Confederate-damaged bridges over the canal. Their choice was to wade the freezing water or cross the bridges which had most of their planks removed by the Confederates. THE SUNKEN ROAD. 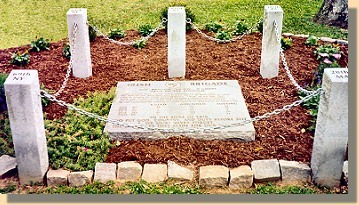 Confederate soldiers, four rows deep, repelled repeated attacks by Union soldiers in the December battle. THE SWALE. By providing a place to hide from the murderous fire, the swale saved many Union soldiers. INNIS HOUSE. 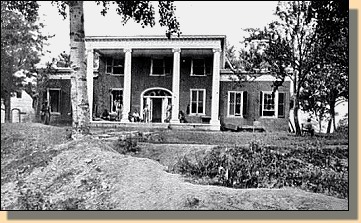 Abandoned by its owner before the battle, the Innis House was used by Confederate sharpshooters. 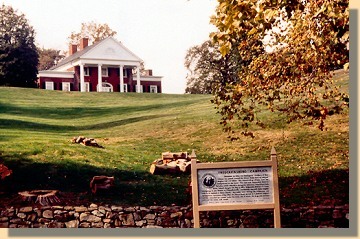 MARYE'S HOUSE (BROMPTON) ON MARYE'S HEIGHTS. Cannon on the ridge near Marye's house (Brompton) and Confederate sharpshooters firing from its upper windows assisted in repelling repeated assaults by the Union forces. The 1864 photograph shows rifle pits in the front. The 2004 photograph was taken from the base of the hill. Sign in the 2004 photograph above. 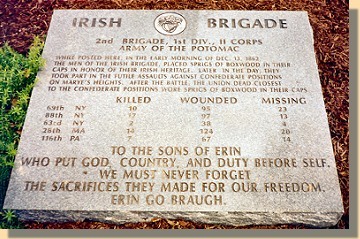 Marker by the river indicating where the Irish Brigade Crossed. * According to the N.P.S. the photographs were taken in 1864. N.A.R.A. reports "1861 - 1865". 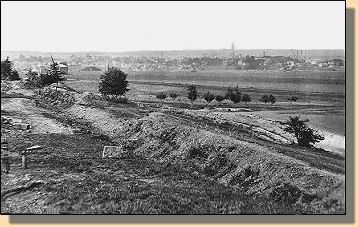 ** This composite photograph is not a copy of the photograph on page 22 of the Fredericksburg Battlefield Guidebook copyright 2001 by TravelBrains Inc. (Sold in N.P.S. Visitor Center Bookstores) - Ed.